Toronto. The city of Toronto is formed from many, many neighbourhoods, one of which in the south east area is known as Corktown (really). 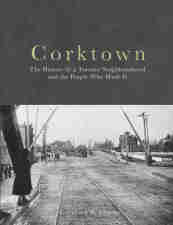 If you haven’t a clue about Corktown or its people, you need to read Coralina Limos’s book of the same title which will be published and issued on December 3, 2018. Check her web site here for current news, and read the press release here on this book about an historic part of our city. This entry was posted in activities-other, book and tagged book, Corktown, history. Bookmark the permalink.